As part of Beijing Fringe Festival, “The Call” (Kaldet) by Astrid Saalbach and “The Last Wave” (Den sidste bølge) by Peter-Clement Woetmann will be performed as readings in Chinese at JuYin Theatre, one of Beijing People’s Art Theatre’s smaller stages. “The Call” is directed by Lene Skytt Rasmussen. Both authors will be present. Chinese translation by Jimbut Jun Feng. The project is a cooperation between Nydanskeren Jimbuts Kulturforening and Teater Grob. Produced by Gritt Uldall-Jessen. Supported by Danish Art Foundation’s Committee for Performing Arts Project Funding, Danish Art Foundation’s Committee for Literary Project Funding, and S.C. Van-fonden. Astrid Saalbach is awarded one of this year’s five Wilhelm Hansen Honorary Awards as “a singular voice in Danish drama”on October 30. 2018. This year’s four other recipients are Mia Steensgaard, Bjarke Mogensen, Kristían Ingimarsson, and Janicke Branth. The Call (Kaldet) premieres in Sweden at Göteborg Stadsteater April 13, 2018 as “Dom blinda”. Read more and order tickets at Göteborgs Stadsteater. Translated to Swedish by Nils Gredeby. Directed by Sisela Lindblom. Featuring Carina Boberg, Fredrik Evers, Johan Hafezi, Lisa Lindgren, Victor Ståhl Segerhagen and Kim Theodoridou Bergquist. Translated to English by Michael Evans. Directed by Breahan Pautsch. Featuring Jennifer Adams, Kim Boler, Jennifer Cheung, Kirstin Franklin, and Madelyn Loehr. The Call (Kaldet) has been translated from Danish to Chinese by Jun “Jimbut” Feng, the translator of Kierkegaard’s Stages on Life’s Way (Stadier Paa LIvets Vei). The Call will be staged in Beijing late 2018. Pietà is staged at Heddadagene, a new theatre festival at nine Oslo theatres from the 9-18 June, 2017. Pietà is played at Det Norske Teatret the 14. and 15. as a guest performance by Haugesund Teater. Players: Janna Kari Kvinnesland and Motiejus Kurmis. The play is staged three times in Haugesund in the same period. Read more about Heddadagene and about the staging of Pietà at Det Norske Teatret. In March 2017 the Russian publisher Tsentr Knigi Rudomino released a collection of eight contemporary Danish plays in Russian translation. One of them is Pietà – or as we now say: Пьета. The collection is introduced by Birgitte Hesselaa. Read more about the publication at The Danish Cultural Institute in Russia. The Call is translated to Estonian and published in an anthology with three other Danish plays. Read the whole piece at TheTheatreTimes.com. The Call (“Kaldet”) premieres at Aarhus Theatre November 25, and plays from November 25 to December 21. Get more information about dates, times, tickets, etc at Aarhus Theatre (in Danish). Directed by: Victoria Meirik. Scenography: Rebekka Bentzen. Lighting design: Kim Glud. Sound design: Ise Klysner Kjems. Players: Christian Hetland, Inge Sofie Skovbo, Mette Døssing, Mikkel Becker Hilgart, Kim Veisgaard, Anne Plauborg Madsen. “From the very first line, Astrid Saalbach builds up the text until it completely encircles the terrifying story in The Call. There’s not one word too many nor one too few …In the staging at Aarhus Theatre … everything is concise and necessary. The Norwegian director Victoria Meirik lets the players enter the world of the blind … Christian Hetland’s seeing geek remains in the mind … a story one cannot shake off … And just like in The End of The World, her play from 2003, Astrid Saalbach has added drops of magic to The Call, leaving one doubting what is a dream and what is reality.” Dagbladet Information. “Astrid Saalbach’s both funny and chilling thriller … In The Call, Saalbach, one of Danish theater’s most important playwrights, sets out to crush the language … it’s masterfully done.” Weekendavisen. “Astrid Saalbach writes with her x-ray vision directed at the human psyche and with a deeply human reference … one of Denmark’s shrewdest and most capable play-crafters … The Call’s passion and pain make it enormously impressive. In less than two hours, Saalbach, in her usual psychological thriller-like way, sets in play a number of fundamental human themes … The Call can’t easily be shrugged off … This is top-shelf, long-lasting, suction-cup-theater.” Five stars. Kirsten Dahl, Århus Stiftstidende. “Can Astrid Saalbach still write superb plays? You bet! … The Call is powerful, original in theme and dialogue – almost exclusively short, condensed sentences, often lacking subject …… Christian Hetland’s Rune is frightfully good … The play ingeniously circles having the courage to choose and to see life in other ways than through the eyes.” Five stars. Jyllands-Posten. “A powerful text that leaves the audience with food for thought. One can be blind in more than one way – one can be visually impaired, or blind to reality. Deftly directed by Victoria Meirik …” Four stars. Ungtteaterblod.dk. “As in a thriller, one is grabbed by the story and repulsed by the main character’s mounting paranoia, especially because of the magnificent performances, chiefly that of the main character, whose madness is convincing and intense.” Four stars. Den Fjerde Væg. Pietà is played in Rome November 22, 2016 at Teatro Petrolini (Via Rubattino, 5, 00153 Roma) with Miriam Spera in the role of the woman who wakes up. Also features: Emanuele Natalizi. Translation and direction: Rosario Tronnolone. Produced by Come in Uno Speccio. Read more at teatropetrolini.com. Red and Green was published in Bengali and English in 2016 and will be available in Hindi in January 2017. All editions are from the Indian publisher Sampark Publishing. 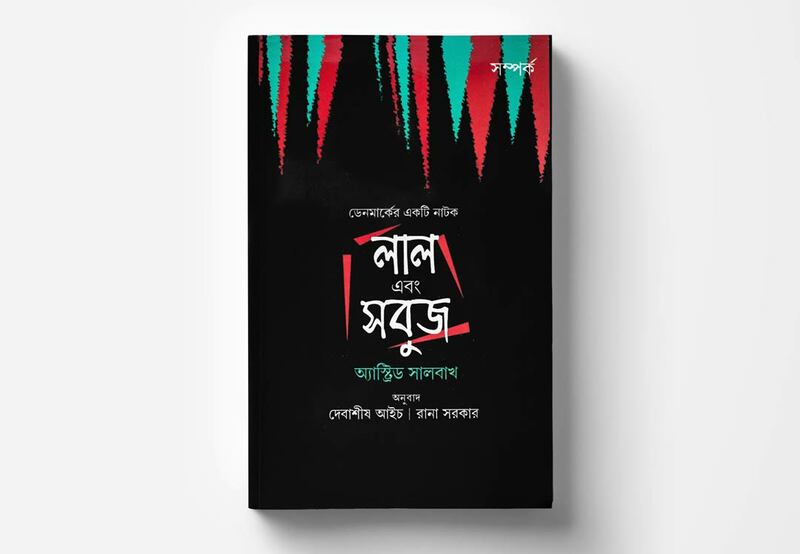 Below: The Bengali edition. The Invisible City is published in Russian in November 2015. The Russian edition was shown at the Moscow international book fair, November 2014. The Rattlesnake is released as a newly recorded audio book, narrated in Danish by Susanne Storm. Published by Gyldendal, June 24th. As part of Danish Drama at The Alexandrinsky New Stage The End of The World / Конец света is read in Russian on Wednesday June 10th at 7 pm at The Alexandrinsky New Stage. Birgitte Hesselaa introduces Astrid Saalbach’s writings, and The End of The World is introduced by Astrid Saalbach. After the reading, an open discussion will be held. Read more at thenewstage.ru. The National Academy of Dramatic Art in Warzawa stages a performative reading of Red and Green on March 25th at 7 pm. The play is translated to Polish by Elzbieta Fratczak-Nowotny. After the reading an open discussion will be held with the participation of Patrycja Manka and Tomasz Zebrowski, two students at the Academy, and Astrid Saalbach. Directed by: Mateusz Olszewski. Performers: Dorota Krempa, Malgorzata Mikolajczak, Angelika Olszewska, Katarzyna Ucherska, Fabian Kociecki, and Filip Kosior. Pietá premieres at Oslo New Theatre, February 12, 2015. With Linn Skåber. Directed by Kim Bjarke. Set design by Even Børsum. Photo (below) by Fredrik Arff. Read more at Oslo New Theatre: oslonye.no. “Partly riotously funny. Wholly deeply, deeply tragic. Skåber evidently loves her [character] Marie, defending her in body stocking and fur… She becomes still more present as she works herself towards the lowest point of her life and through the many bottles that keep appearing. This is proof of Linn Skåber’s capacity on ‘the dark side’.” Jon Selås, VG. “When Linn Skåber rises from her bed and walks the floor in a black body stocking open at the crotch, the audience giggles. Linn Skåber has a way with characters that lack situational awareness, and at Centralteatret, Kim Bjarke directs the play as if the part was written with her in mind. Skåber excels with a varied performance that works well, also with the comic punchlines and wordplays that are part of Marie’s still more solipsistic and alcohol-foggy self-promotion.” Therese Bjørneboe, Aftenposten. “The script is damn good, balancing on the thin line between the tragic and the comic. One moment, Marie makes us laugh with a funny line. The next, she strikes out at us with a knife. Linn Skåber is a stroke of luck as Marie. This is her career’s strongest performance.” Jon-Harald Thorsås, KulturSpeilet. “It takes something to fill the stage for an hour and a half all alone, but Linn Skåber does a great job… Her body language and facial expressions make the mythomaniac, damaged Marie real, and Skåber conveys the many layers of the text with an impeccable ear … She carries the play beautifully.” IdaLou Larsen, Klassekampen. Astrid Saalbach will be at Bogforum, Bella Center, Tranescenen II, Saturday November 8 at 4:15 PM in a conversation with Nanna Mogensen about The Rattlesnake. F, a middle aged woman in a crisis, spies on four young women in a small hair salon, the center of femininity. Using all means at her disposal, F attempts to get close to them: Mette, Jorun, Trine, and the recently arrived Boogie, a stranger with a shadowy past and a remarkable talent for accounting. Who are these women? Who are their many customers? Who is F, herself? What is it that clouds her conscience? When Boogie disappears, F’s dubious enterprise is brutally revealed. A tragicomic play about being a woman and having difficulties with other women. About gender as construction, biology, or a curse. About fiction and reality, and losing one’s way between the two. “At the core, the play is an astute description of women’s feeling of impotence when it is allowed to grow to nightmarish dimensions. It’s a sharp look at a world of women where men are incompetent, and where “readiness for change” is nothing but a cliché in the Cosmopolitan magazine. Director Søren Iversen summons the mildest, wildest and weirdest in his charming female ensemble, and the players soar with hormones and humour.” Anne Middelboe Christensen, Information. “Astrid Saalbach’s new play about a stranger entering a claustrophobic house of mirrors is both witty and wacky. A danse macabre where realism and evil dreams meet. It’s rough and grotesque. But it’s (…) also satire on a high level.” Klaus Rothstein, Weekendavisen. “Entertaining, innovative and well put together. Full of funny and outlandish characters and episodes, that – at least for me – ring true. Handles big subjects, especially for women, worth considering for everybody.” Katrine Tøt, Kulturshot. “Good comic performances by five strong women. The salon symbolises an oppressive culture that holds women to impossible standards of beauty. The many changes of roles and masks is an interesting device in the play’s depiction of women as dress dolls, whose looks are dictated by men.” Three stars. Kristian Husted, Politiken. “Aesthetically superb. A requiem in a house of mirrors, a mass for the estranged pseudo-female. The stage design by Stine Martinsen, who is also now starring at Folketeatret and Göteborg Stadsteater, is a precise metaphor for women’s never-ending self-reflecting emptiness, featuring moments of beautiful transformations.” Maria Ciccia Smidl, Sceno. Novel about a Danish playwright, who flees from professional trouble to an artist residency in the mountains of California. Here, she encounters something so frightening that the rapidly escalating problems at home – involving theatre directors, publishers and Swedish feminists – pale in comparison. Published in Danish by Gyldendal, May 2014. Pietà premieres at Malmö Stadsteater, February 27. Director: Clas Göran Söllgård. Translation: Staffan Julén. Cast: Li Brådhe. “A superb performance” – Skånska Dagbladet. “Perfect” – Kvällsposten. More reviews, photos from the performance, etc: www.malmostadsteater.se. January 9-10: Red and Green, reading at Lekhana Literary Festival, Bangalore. January 13-14: Apeejay Kolkata Literary Festival. January 23: Reading and lecture at Delhi University. January 25: Lecture at Rohtak Art Academy, Haryana. Lecture at Karls University, Prague, October 2013. In May 2013, Pietà is played at Divadle Horni Pocernice in Prague, featuring the actress Vilma Cibulková. The staging was also recorded and broadcast by Czech radio. Little Soldier, a short monologue for a young woman, is published in the theatre magazine Teater 1 (Denmark), June 2013. The piece is also translated to French by Catherine Dubost. Awarded Djerassi Artist Resident Program residency in Woodside, California, March 2013 and the Søren Gyldendal Travel Grant, April 2013. Pietà opens at Spazio Uno in Rome, November 19th, 2012. Pietà is staged at the Toronto SummerWorks festival August 9th to 19th, 2012. Direction: Sarah Garton Stanley. English translation: Michael Evans. Read about the SummerWorks festival at www.summerworks.ca. Pietà opens at Theatre Horni Pocernice in Prague, April 2012. The play is broadcast as a radio play in Czech radio, May 2012. The Displacement is awarded a prize by The Danish Arts Council, March 2012. The novel is bought for publication in 2012 by the Icelandic publishers Draumsyn. Astrid Saalbach was appointed to The Danish Academy in October 2011 and was awarded The Dan Turèll Medal (called “The Dan Turèll Prize” until 2011) in March 2012. The novel Fordrivelsen (The Displacement) is published in Danish by Gyldendal, October 2011. The Dancing Lesson opens in Prague, October 2, 2011. Red and Green premieres in America at Akvavit Theatre in Chicago, September 15, 2011. Cast: Wm Bullion, Mary Jo Bolduc, Matthew Isler, Breahan Eve Pautsch, Kirstin Franklin, Odie Escondo og Ramona Kywe. Translation: Michael Evans. Reviews: Chicago Tribune and Newcity Stage. On Thursday, April 7, between 4 PM and 5:30 PM, University of Copenhagen Amager is hosting a conversation between Astrid Saalbach and the critic Per Theil on “The Other” in drama. A scene from Red and Green will be played as a prelude. Location: University of Copenhagen, Amager Campus, Humanities Library, Njalsgade 112, 2300 Copenhagen S. Admittance free. Everybody is welcome. Pietà opened in Tampere, Finland in January 2011. The play is staged in an actual hotel room, equipped with surveillance cameras. Video feeds from the cameras are shown to the audience outside the room. The End of the World is published in Chinese by Oriental Press, Beijing, 2010. Red and Green opens at Aarhus Theatre, September 2010. Gyldendal has published the two plays, “Red and Green” and “Pietà”, together in book form. Available in paperback. 152 pages, DKK 149,00. The book is available at your quality bookshop or online at academicbooks.dk or saxo.com. “Saalbach is one of our greatest living playwrights. She manages to present contemporary problems in a dream-like form, which elevates their urgent political topicality to the universal domain” Lilian Munk Rösing, Information. Complete review on information.dk (in Danish): An eerie and poetic phantasm. “Astrid Saalbach is one the best cards of Danish drama – and in international drama. Gyldendal now publishes two of the most recent plays, already staged several times, both nationally and internationally.” Erik Svendsen, Jyllands-Posten. Complete review (in Danish) at kpn.dk: Sceneskift. Red and Green had its world premiere at Stockholm City Theatre in March 2010, opened at the Royal Theatre in Copenhagen in April 2010 and will be followed by a run at Aarhus Theatre in September 2010. A group of European aid workers in a third world country torn by civil war; Nepal springs to mind. One person is homesick, another disconnected herself long ago, yet others are drifting, having lost their sense of place. Promiscuity is rampant, and while testing private and professional limits, all try in different ways to repress the fact their work may do more harm than good. This is a kaleidoscopic tale of power and impotence. The End of the World was produced at Le Theatre du Trillium (Ottawa, Canada) in 2009 and at Rogaland Teater (Norway) in April 2010. It was also performed as a reading at The International Theatre Festival in Rumania in 2009. The End of the World is nominated for nine Rideau Awards, among others, as best play. The director of the 2009 production of The End of the World at Divadlo na Vinohradech in Prague has won the Talent of the Year Prize for his interpretation. Published in Rumanian in 2009. Pietà was staged at Aarhus Theatre, Denmark, 2009. Pietà was shown at Teater Grima (Faroe Islands) and Molde Teater (Norway) in 2009. The Cold Heart opened at Teater Galeasen (Stockholm) in April 2010. The Blessed Child was performed at Halcyon Theatre (Chicago) in 2009. The novel The Finger in the Flame (first published by Gyldendal in 2005) will appear in Estonian in May 2010.